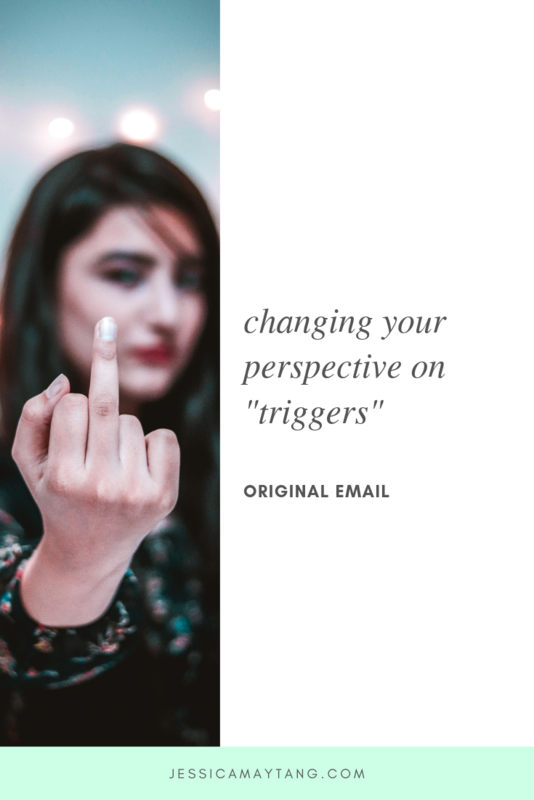 changing your perspective on "triggers"
*First published via email on Friday, February 1, 2019. Click here to subscribe. Yesterday, I sent out an email talking about how finding stability in most areas of our lives can help us be more courageous in our endeavors to do something "out of the box" in other areas. For example, me finding a job for a steady paycheck will allow me to keep sending emails and building a great relationship with you without that edge of desperation for my business to make me money. I resisted this idea for a VERY LONG TIME. There are parts of me (namely, ego) that still are. Just hearing the words "security" and "stability" makes me want to shake myself. Those two words are like two yappy, nippy little dogs who are biting my ankles and I'm trying desperately, hopping around, shaking my foot to shake them off. Even though being a starving entrepreneur, for me, is not a cute way to live, my ego refuses to think that going back to work is somehow helpful to me. It keeps feeding me thoughts like, "If I go back to work, if I become a seeker of stability and security, I'm a total sellout, a total failure." So everyday, I've been my best to listen to my ego. To really hear what its concerns are. Because I know that the more I resist ego, the more resentful I'll become towards my situation, and frankly, towards myself. Today, my inner self reminded me of an exercise I share during one of my challenges in December. I had everyone ask their inner self for their core values. One of the participants said "freedom." She's a fashion designer and has lots of orders for custom-made garments to fill, and she hates working on a deadline. Thinking about deadlines makes her solar plexus feel very uncomfortable and restricted. But she knows she needs to meet deadlines in order to make money. So I encouraged her to find a way to think of the deadlines from the perspective of freedom. "How is fulfilling your deadlines another form of freedom?" She got quiet to listen to her inner self, and eventually said, "When I fulfill my deadlines, it gives me more freedom to do what it is that I want because now I have money. Having money means I am worrying less about bills, and that gives my mind more freedom to be creative. And creativity is another core value that my inner self has!" Stability and security are not negative words, as much as my ego is convinced that they are. They're just words. Just like how "deadline" is a word. None of these words have to mean restriction or pressure or less freedom. It's the meanings that we assign to those words that create the feelings of restriction and pressure and less freedom inside our bodies. "How is stability and security in a stable paycheck allowing me to be in alignment with my inner self?"